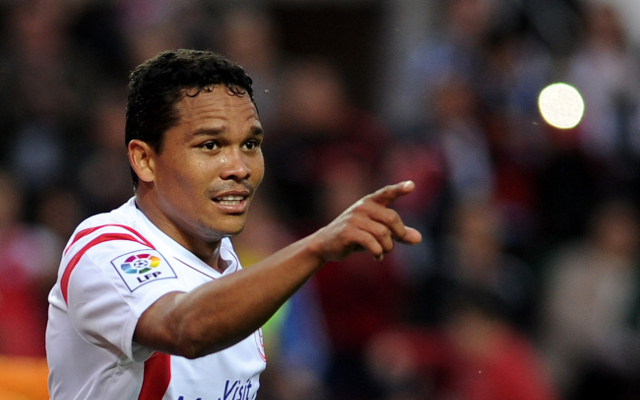 AS Roma have joined the growing list of suitors for Sevilla striker Carlos Bacca, who has also been tipped to replace compatriot Radamel Falcao at Manchester United. With the AS Monaco striker returning at the end of his loan deal this summer, having potentially already played his last match for the Red Devils, Louis van Gaal and his scouting team are believed to be considering alternatives. “It is true because I cannot deny it – Robin van Persie cannot deny it, Falcao cannot deny it and Rooney is not playing there much any more,” explained the Dutchman to the Guardian in February. According to the Metro, United are interested in signing Falcao’s international teammate Bacca. The 28-year-old has been in sensational form for Sevilla so far this season, scoring 20 in 31 La Liga starts, and also contributing six assists in the process. He has scored a further five goals in the Europa League as Unai Emery’s side have romped to the final. Although just a year younger than the man he could replace at Old Trafford, Falcao has clearly been off the pace since knee surgery, and Bacca is in his prime. However, he isn’t expected to be at Sevilla beyond this summer, with several major European sides interested in his services. La Gazzetta dello Sport [via Foot Mercato] reveal that along with the likes of AC Milan, Atletico Madrid, Paris Saint-Germain and, of course, United and Roma are now keen on the former Club Brugge striker. The Italian source confirm that coach Rudi Garcia is a big fan of the striker, and has identified him as someone who could help the Giallorossi overhaul Juventus in the race for the Serie A title next term. Bacca prides himself on his finishing and upper body strength, but his passing and buildup play arguably leaves a little to be desired. If he transfers and continues to find the back of the net so regularly though, this will of course be forgiven.